LG reveals Super UHD TVs and first production 8K TV | What Hi-Fi? LG wants to put the Super in Ultra HD at CES 2016 and will also reveal a 98-inch 'production-ready' 8K TV that's due on sale later this year. CES may not yet have opened its doors for 2016, but the news on new products is already trickling out. 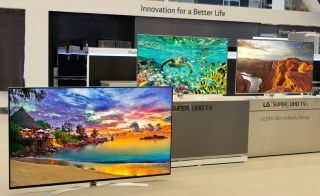 Following the revelation that all of Samsung's 2016 smart TVs would be 'IoT-ready', LG brings details of four huge new 4K TVs, including two premium Super UHD models. Promising to be slimmer than ever and coming with support for 4K HDR content, the new sets will also be joined by LG's first production 8K TV - a 98-inch 8K Super UHD TV, no less. LG says its 8K TV will be ready to go on sale in the second half of 2016. Slightly more realistic for most of us might be the new 4K models. LG is calling these sets 'Super UHD', somewhat confusingly following the launch of Samsung's SUHD TVs at last year's CES. Samsung would never quite confirm what the 'S' in SUHD stood for but at least LG is adamant that it's Super as far as its new TVs are concerned. There's a 65in UH8500 and a 75in UH8550 in the Super UHD range, each promising support for 4K HDR content - LG calls this feature HDR Plus. The TVs use 10-bit panels and 10-bit processing, and there's support for the BT.2020/rec 2020 colour specification. Also new are the 'top-of-the-line' UH9500 and UH9550 IPS 4K TVs, the 65in UH9500 and 86in UH9550, which LG claims are the industry's most advanced In-plane switching (IPS) displays. Expect these sets to be joined by new LG OLED models at CES, with LG claiming to be focused on IPS and OLED TVs for 2016.